Nanostructures and natural patterns have long fascinated researchers in bioinspired materials engineering. Biological samples can be imaged and observed at the nanoscale using sophisticated analytical tools in materials science, including scanning electron microscopy (SEM) and transmission electron microscopy (TEM). While imaging methods contribute to the understanding of structures by revealing material properties for biomimetic materials synthesis, they have often done so with the loss of photonic properties inherent to the materials. In a new method, materials scientists Boliang Jia and colleagues at the departments of mechanical engineering and robotics presented a printable biocompatible superlens placed directly on objects of interest to observe subdiffraction-limited features (resolution beyond the diffraction limit). They then viewed the natural features using an optical microscope to demonstrate nanoscale imaging of butterfly wings in color. 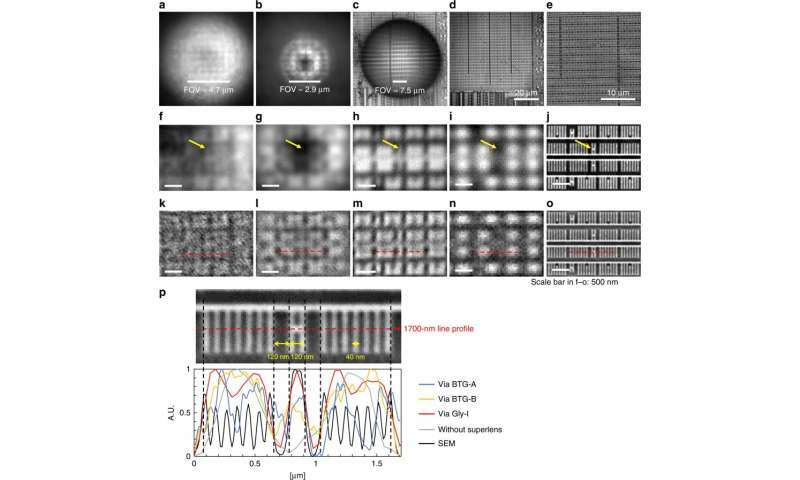 The study allowed super-resolution imaging and a larger field of view (FOV) compared to the previous dielectric microsphere-based optical systems of super-resolution microscopy. The new approach created a fast and flexible path to observe the direct colors of biological features at the nanoscale in the visible range. The results are now published in Microsystems and Nanoengineering, where the work allowed optical measurements at the subdiffraction-limited scale. A superlens is based on an optical material with a negative index of refraction (optical metamaterials) that could experimentally reverse nearly all known optical phenomena. Technically, a thin negative-index film can function as a 'superlens' to provide image detail with a resolution beyond the diffraction limit to which all positive-index lenses are subjected to. In the study, Jia et al. 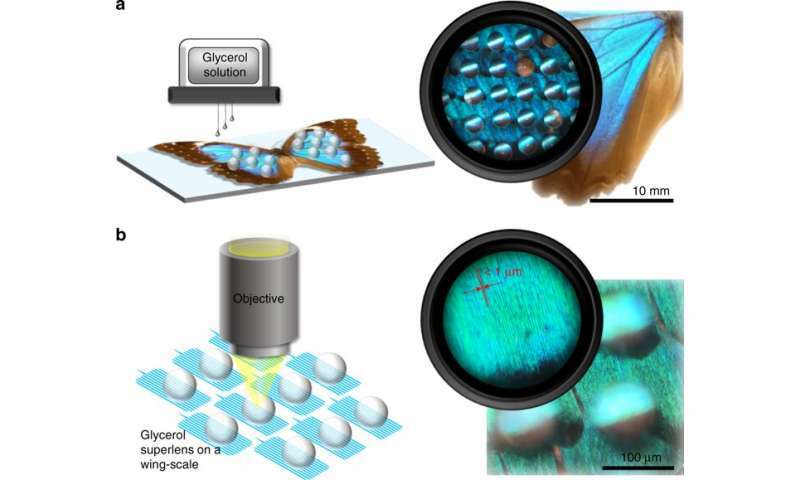 devised a method to print glycerol (transparent liquid) on to butterfly wings and observe nanoscale wing structures hitherto unobserved via conventional optical microscopes. The work will pave the way for advanced liquid superlenses coupled with fast and flexible methods in optics. The results will assist nanostructural inspection via biophotonics in biological and non-biological samples. The butterfly wings of Morpho cypris were first observed via high-resolution SEM in 1942, which led to the discovery of detailed structures below the diffraction limit using sophisticated tools. Since then, Morpho butterflies have been a subject of interest in bioinspired materials research due to their iridescent color and distinct photonic properties. For decades, the properties of light interference resulting from their brilliant nanostructures have attracted great interest in nanophotonics and biomimetic materials research. However, direct optical observations of the subdiffraction-limited structure of the wings at the nanoscale yet remain to be reported. High-refractive-index microspheres in aqueous media have attracted great interest in recent years for observing liquid-immersed biological samples such as biological cells in vivo. Yet, the method is not favorable for samples with high-refractive index in dry conditions. In the present work, Jia et al. presented an in situ printed biocompatible glycerol superlens (SL) with higher resolution and larger FOV than barium titanate glass (BTG) microspheres under dry conditions. The scientists chose glycerol since it is a transparent liquid with a relatively high refractive index that is capable of printable droplet formation across a wide size range. As an important feature, glycerol contains strong inter-molecular interactions and is therefore highly resistant to evaporation. Although microdroplets of water typically evaporate almost instantly, by comparison, glycerol printed as droplets with a volume of 50 percent could exist at least for a day on substrates without significant size changes. Jia et al. therefore directly printed glycerol superlenses on a Morpho butterfly wing using an ink-jet printing machine. Thereafter, they characterized the glycerol images using a central processing unit (CPU)-integrated circuit (IC). The scientists observed nanobiostructures ranging from 50 nm to 200 nm in scale. In the work, the scientists adjusted the viscosity of the glycerol solution via dilution tests with MiliQ water to select an optimal concentration of 50 volume percent (50 vol%) for printing. In optics, solid immersion lenses (SILs) can enhance optical resolution by increasing the effective numerical aperture (NA) of the imaging medium. The droplet lens is considered a liquid version of SILs with a flawless surface. The scientists first characterized the printed glycerol superlenses in the study using a different number of drops per lens on a clean silicon wafer before administration on butterfly wings. They selected the ideal number of drops per lens after a few trials; the resulting diameters of the glycerol lenses were comparable to BTG microspheres. Thereafter, they compared configurations of the experimental setup for the BTG microspheres and the glycerol superlens. The work showed that large BTG microspheres provided a large FOV, while a higher resolution was obtained with smaller BTG microspheres. When the scientists compared the images obtained with glycerol superlenses and those obtained using BTG, the results significantly improved in uniformity for images obtained using glycerol superlenses, alongside sharper nanoscale features. This implied that printed glycerol superlenses offered superior resolution capacity compared to BTG microspheres of equal and smaller sizes in air. In their work, Jia et al. observed two types of butterflies: Morpho Menelaus and Agrias beatifica beata. The scientists printed 60 glycerol drops (or lenses) on the butterfly samples to obtain spherical lenses approximating 95 µm in diameter. They observed the wing-scale features via an upright microscope system. The scientists were able to capture the ventral wing scales of the butterflies, where the Morpho species displayed two types of wing scales; ground and cover scales. 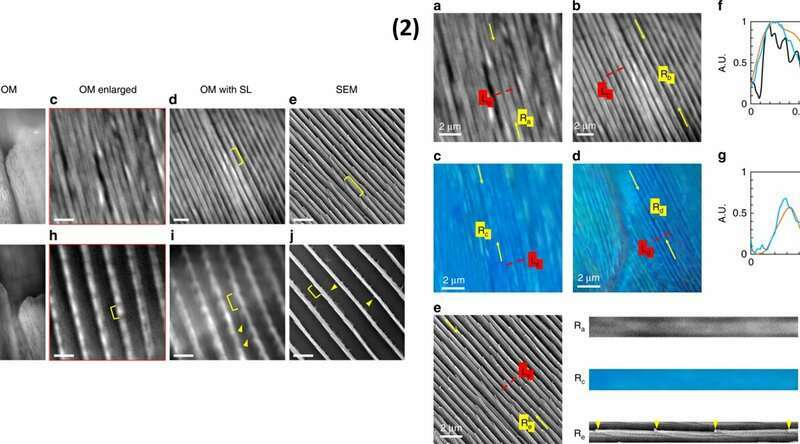 In comparison to SEM, glycerol superlenses were unable to resolve complete structures entirely, but they showed the existence of substructures between the ridges of butterfly wings. For example, Jia et al. showed that in situ glycerol superlenses could extend the limit for nanoscale structures in biological samples to approximate 200 nm in width. Additional experiments showed the ability to color-image subdiffraction-limited nanobiostructures using the superlenses. The new method offers a cost-effective, fast and high-resolution imaging technique to visualize subdiffraction-limited nanobiostructures in situ. 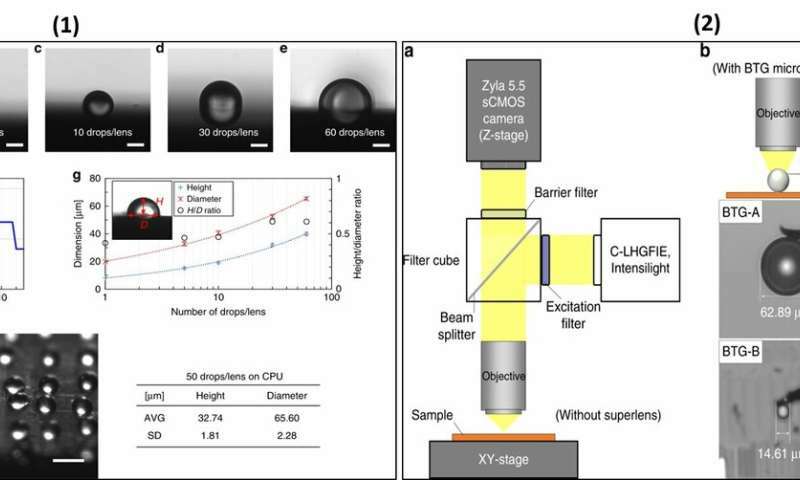 The work paves the way for water-immiscible liquids with high refractive indices to print liquid superlenses for water-immersion-based imaging applications. Biocompatible liquids such as silicone oil can be explored as superlenses underwater via low cost ink-jet printing next. Materials scientists continue to work toward engineering advanced liquid superlenses in nanobiophotonics. The scheme introduced by Jia et al. provides a fast and easy-to-implement strategy to observe nanobiostructures in biological and nonbiological samples.